I am often asked why, after photographing people for several years, I decided to close my portrait studio last year only to reopen as a pet photographer working with shelter animals. My immediate answer is that, quite honestly, I enjoy working with animals more than people. The deeper answer is that I didn’t choose it, it chose me. Having volunteered for several years with Middleburg Humane Foundation, my family and I are no strangers to animal rescue. When we bought our home in 2009 we knew we wanted to add a dog to our family. I volunteered with the MHF before I was married, and decided that the experience would make for a meaningful family activity. What started out as a, “Let’s volunteer to see how much work goes into caring for a dog” turned into a deep commitment to animal rescue, foster care, and adoption. We adopted our first dog in 2010 and have since added three more shelter dogs and three adopted ponies to our family. Our first adopted dog, Reba, sadly passed away in the beginning of 2015 as a result of bone cancer. In the midst of my tears and grief I promised myself that I would use my photographic talents to benefit animal shelters and rescue organizations, raising awareness and helping to find homes for the animals. From that promise grew a vision, a new direction for my photography business. Every year millions of animals, from hamsters to horses, find themselves in the care of shelters and rescue organizations. Some are surrendered for personal or financial reasons, some were seized and saved from abuse and neglect. Unfortunately, many of those animals languish in the shelter for months or years, or worse yet, never make it out of the shelter at no fault of their own. They simply didn’t have a big enough voice. I realized that I could help to give these animals a voice and to change the way people perceive shelter pets. Unfortunately, there are still many misconceptions about shelter pets, and for a voiceless animal in need of a home, a good first impression could mean the difference between life and death. A professional and compelling portrait has the ability to save an animal’s life, and has been proven to increase adoption rates. And so, Furry Paws Photography was born. At first I thought that I could offset costs of working with shelters with my paid client work, but as the need for shelter portraits increased, my time for private clients has decreased. In 2016, I hope to turn my business into a non-profit and work exclusively with local shelters. This has also led to a personal photography project called “Finding Home,” a portrait series of animals that were adopted and given a second, third, or even a fourth chance at a happy life. I am currently in the middle of photographing my models. A few months ago I put out a casting call and the response was overwhelming. I have photographed nearly forty dogs, a few ponies, and even two guinea pigs! In the upcoming months I will finish taking all the portraits, and then start the arduous task of writing, editing, and publishing. It is another way I hope to combat the negative perceptions people have about shelter pets while emphasizing the joy and happiness these animals bring to our lives. Updates on this project can be found on my business Facebook page. My family and I have some big plans for the near future. We currently board my daughter’s ponies at a beautiful little farm in Casanova, Virginia, but with all the animals we’ve adopted, we’ve begun looking for a farm of our own. Our dream is to fill a small farm with all rescue animals, from dogs to cats to chickens to horses to livestock, giving these animals a second chance at life. I believe we are all given certain gifts and talents in life, and it is our duty to uncover, develop, and use these skills to make the a better place. Over the years I have come to realize that I can improve the world by helping these animals find a permanent home. In the grand scheme of things it may not seem like a lot, but it means the world to that one animal. Finley is a 1-year-old lab mix adopted from Two Hearts One Home Rescue in Broad Run, Virginia. He was scheduled to be euthanized twice, first for being surrendered to a high-kill shelter and the second time due to having Parvo. Due to the kindness of a shelter worker he was nursed back to health and transferred to Virginia. 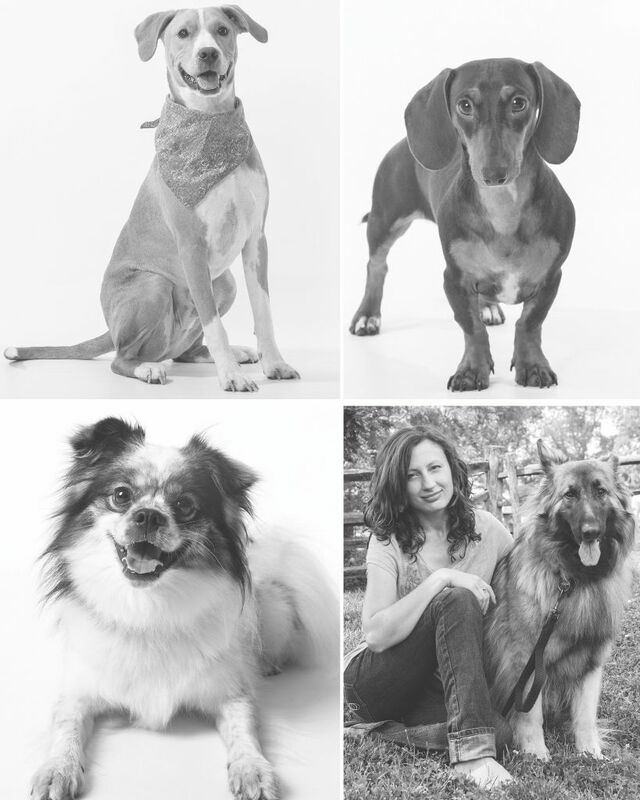 Ava (opposite page, top right) is a 1-year-old miniature dachshund who was given away on Craigslist as part of an unexpected and unwanted litter of puppies. She shares her home with 4 other dog and true to her dachshund nature, she is head of her dog pack, including 2 pitbulls and a German shepherd. Tucker (opposite page, bottom le ) is a 3-year-old papillon mix adopted from Middleburg Humane Foundation in Marshall, Virginia. He was bought o Craigslist, surrendered to the Prince William County Animal Shelter, adopted, and then surrendered to Middleburg Humane Foundation. Despite his beginnings, he has an infectious zest for life and dances with excitement when he meets people. Reba (opposite page, bottom right, with the author) was Dyrholm’s personal rescue German shepherd. She lived quite the happy life with the Dyrholm family, and recently passed away due to complications with cancer. 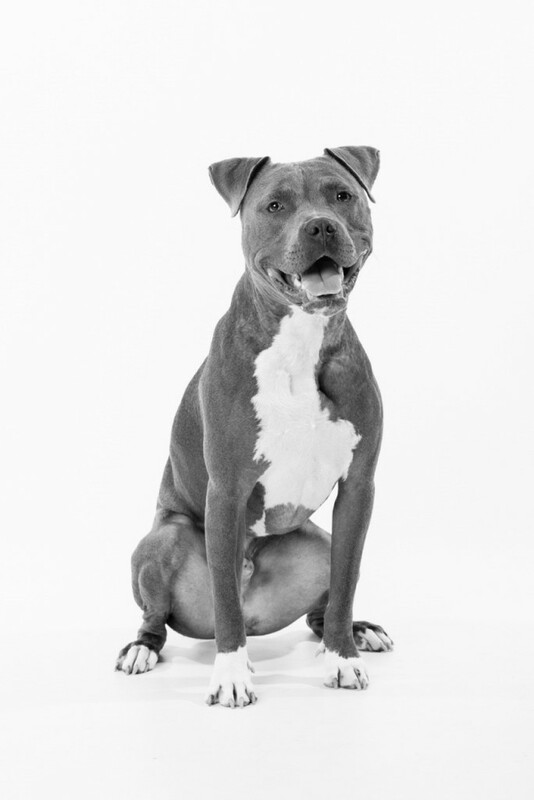 Storm (1st photo in article) is a 2-year-old pitbull adopted from Deepwood Animal Rescue Foundation in Centreville, Virginia. He was bounced between 3 di erent homes and used as a guard dog before becoming a “foster failure.” Despite his terrible beginnings, he is now a wonderful example of the true pitbull nature.